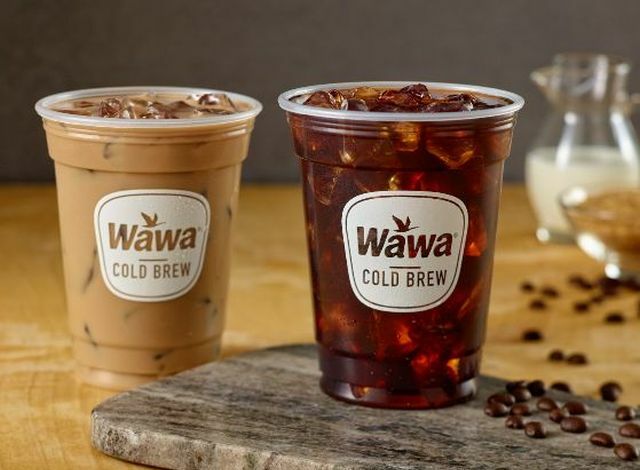 Regional convenience store chain Wawa debuts new cold brew coffee as the latest addition to their coffee offerings. According to the chain, Wawa Cold Brew "is made through a small-batch process using triple-filtered water and low temperature extraction which delivers a smooth, bold coffee experience with very low acidity and virtually no bitterness." The new coffee is served over ice in either 16-oz and 24-oz cup sizes. Two varieties are available: Traditional Black or Sweet Cream. As the names suggests, Traditional Black is comprised of just ice, coffee, and water, while Sweet Cream incorporates sweetened cream into the mix.